Add File - Opens .js or .efs files. Delete File - Deletes .js or .efs files from the List of the files. Shows the list of the files to be processed. Set Header - Adds a header comment to processed file. Rename - If selected, new output files will be created with a defined suffix. Rewrite source - If selected, source files will be rewitten by output files. Backup files with .bak extension will be created as well. 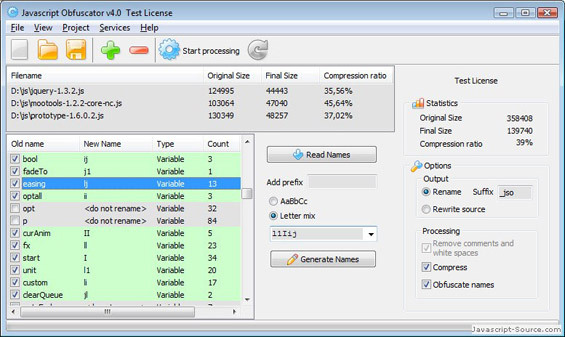 Compress - If checked, source code will be compressed. Obfuscate names - If checked, variables will be renamed depending on "Names" list settings. To rename in Manually - mode you should double click on a necessary name and type a new one. To rename in Auto - mode you at first should mark the names in the Rename Panel. Use the right-click context menu for it. After the necessary names are marked you can generate new names. You can add prefix, use letters or letter mix. Read Names - Reads variable names from opened files. Add prefix - Prefix will be used at the beginning of the generated name. AaBbCc - All alphabet will be used for generated names, starting with "A" for name with max Count. Letter mix - Chars from this charset will be used for generated names only. You can type your own set or select a pre-defined one. Change names in string - If checked, variable names found in strings will be changed. Use with caution. Not fit for short or common names. Generate Names - Generates new names for selected variables. jso.exe myproject.jo3 process -runs myproject.jsp and processes files depending on myproject.jo3 settings. Log is in myproject.log. jso.exe myproject.jo3 process --files gallery.js gallery.dun.js items.js -runs myproject.jsp, adds gallery.js gallery.dun.js items.js files and processes files depending on myproject.jo3 settings. Log is in myproject.log. jso.exe myproject.jo3 process --header headerfile.txt -runs myproject.jsp, defines header file and processes files depending on myproject.jo3 settings. Log is in myproject.log. Ordering online is easy and secure. You can select the most suitable payment method: credit card, bank transfer, check, PayPal etc.. Paying a license fee, you get the right to use the program for life and to get free updates within one year. After you complete the payment via the secure form, you will receive a license key instantly by email. Secure payment processing by Plimus. comparing with other minifires available on the Web. See the comparison table below. depending on the selected settings or pre-defined presets. Just drug-n-drop files to the program window and press "Process" button!